sirs! 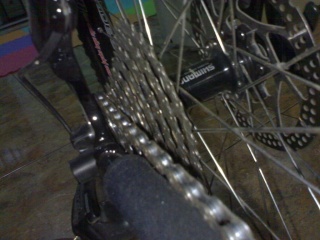 i would like to ask wat brand of chain ring set is good for beginners and what would be the cost, can i buy those in quiapo?...i still use a 27 speed shimano deore ...i don't think it would be okay, a little heavy..
tanggalin mo lahat ng malalaking chain ring. tira mo yung granny or yung pinaka-maliit. 22t, then set mo yung cog mo sa 19t or 18t. shoot na yun. korekek, tangal yung dalawang malaki. tus maganda din kung mapalitan mo ng bash ring foe proteksyon. sir thank u po...di ko alam na nababaklas pla ung plato...panu po ung sa sprocket? kelangan ko po tlgang bumili ng single lng? tsaka panu po ung roller? tanggalin ko na po un dba?...pero tlga po bang dapat single speed lng pag nag trials?..tnx po ulit sir! Yup, trials are supposedly single speed. But sometimes it's riders choice to use single ring up front and the whole cogset on the rear. I think Je-ar is still using middle and granny chainring up front and 8speed cog on the rear. This is because he use is bike to go to work. Joolz have that kind of setup back then. Then shift to granny (front) and 19t or 18t (rear) when in trials mode. meron itong 4 okaya 5 bolts. pero meron din naman di talaga nababaklas bro. maganda nyan, makontak mo talaga sina abe. jerome pwede mo din post yung rig mo, para pag aralan natin magiging diskarte natin. 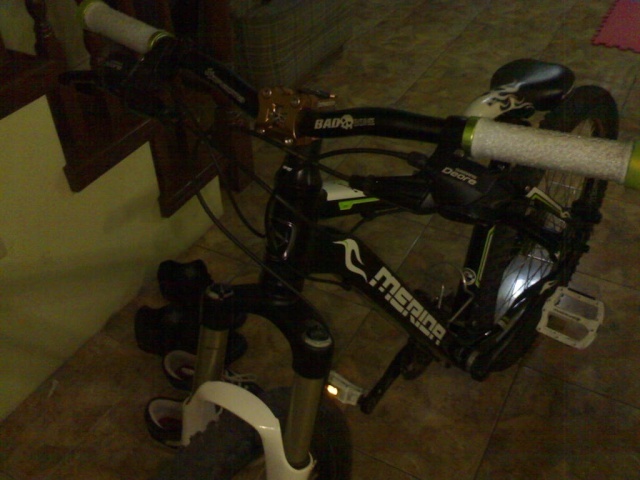 sir eto po ung pics nung bike ko. No need for modification bro. I suggest get a trials bike...Don't destroy the harmony of your build. But if you really wanna do it, this is what I suggest. 1. Remove fork and replace it with a rigid. This will make your BB low as in very low. If you don't want to use rigid. get a fork with 50mm travel. 2. Remove stem and change it with a longer and higher degree angle. I think thomson has a good stem. This is to make your bike a bit longer. 3. Remove saddle and look for a smaller plastic saddle to replace it. Lower your seat post toto it's maximum. This is for less hassle and to give you more space with your bike. 5. I know you want to use it for other purposes not just for trials so retain shifters and cogset. Just shift to granny (22t) in your front and 18t in your rear when in trials mode. 6. remove the bottle cage. No use when doing trials. 7. Wider rim (atleast 32mm or 38mm or 46mm) and wider tire (around 2.35-2.5) for the rear. This to absorb heavy impact. Grind your rim's sidewall. 8. remove Handlebar andreplace it wider one. Atleast 700mm in length. This will help you with balance. 9. Remove disc brake on your rear and put a descent vbrake. 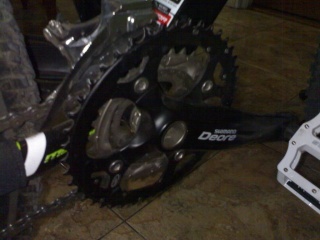 Shimano XT or Avid arc rival. with trials specific brake pads or you can use mob regular pads as an alternative. Add a booster. This is for a sudden stopping/braking. I think that should work. But be carefull in learning pedal kick, it will wreak your rear hub. tnk u po sa mahabang suggestions sir ...madugo-dugo to...thank you po. malaking tulong po to....mabuhay pinoy trials! Bro, eto yung mga bikes namin dati. Vision Pursuit is a good frame to start with, pero if you have the budget, you can start with a specific trial bike. Tama, dun nga yun! Baka stroll lang kami bukas within Pulilan on our MTB, you can join us. Regarding kung kelan kami magkakaroon ulit ng trials ride: di ko masabi dahil sa Calumpit na ko nakatira at wala naman akong wheels. Mahirap kasi i-angkas ang bike sa jeep, maraming driver ayaw pasakay yung bike.